Program highlights the role of CSD in helping Latino families overcome barriers faced by their children with autism. 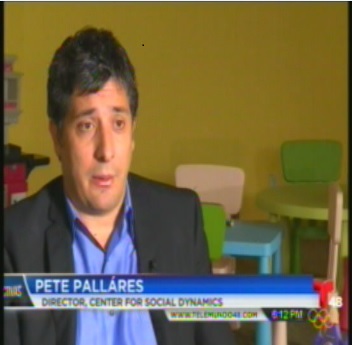 Center for Social Dynamics (CSD) was recently profiled on the Telemundo Spanish-language news program Noticiero. The segment, which aired on April 20 on KSTS channel 48, highlighted the barriers that Latino families face finding diagnosis and therapy services for their children on the autism spectrum. CSD offers autism diagnosis, assessment and therapy in a number of languages, including Spanish, and in doing so provides hope and results to families who otherwise might not seek or obtain therapy for their children. Telemundo interviewed two CSD clients and their children as well. At the end of the segment one child prone to antisocial behavior distributes hugs to the CSD and Telemundo staffs, brings smiles to their faces and in doing so offers testimony to the success of his therapy. The full segment can be seen here: http://centersocialdynamics.com/in-the-media/. Founded in 2012, CSD offers autism diagnosis, assessment and ABA therapy in addition to social skills groups to children of all ages in the greater San Francisco Bay Area and Sacramento County. CSD accepts numerous insurance carriers as well as private pay clients. If you are interested in learning more about how CSD can support your child with autism please call us at 510-2688120, send an email to media(at)centersocialdynamics(dot)com, or visit our webpage at http://www.centersocialdynamics.com.